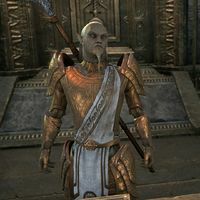 Lector Naril is a Dunmer Clockwork Apostle and the head of the Everwound Wellspring, a facility with the noble aim of growing food for the Clockwork City. Oasis in a Metal Desert: Help a novice Clockwork Apostle investigate a farming facility in the Clockwork City. "I always share a few words of advice with the hopefuls that weren't selected before I take the new apprentice under my wing. The Everwound Wellspring provides excellent opportunities for the novice apostles." Tell me about the Everwound Wellspring. "You must be one of the new arrivals I've heard so much about.Everything in the Clockwork City—the soil, the flora, the fauna—it's all composed of gears and pistons and metal. It's like that everywhere. Everywhere, that is, except here." Why is the Wellspring different? "Because Sotha Sil set the Wellspring in this metallic desert and blessed it with a reservoir of water—an exceedingly rare thing in the Clockwork City! He planned to create an oasis, but moved on to other projects before the task was done." If the oasis wasn't finished, where does the harvest come from? "We had water and a pressing need. It didn't take me long to figure out how to make actual, living plants grow in this artificial soil.Now save your questions and let me show you some of the wonders of the Everwound Wellspring!" All right. Let's see your oasis. Lector Naril: "Come, everyone! Follow me into the Viewing Garden!" Lector Naril: "My friends, the Wellspring enjoyed a bountiful harvest! Let me show you how we accomplish our miracles." Lector Naril: "Simulated sunlight allows our trees to produce fruit sweeter than the orchards of Vvardenfell!" Lector Naril: "These pipes carry an alchemical solution that nourishes our plants." Lector Naril: " Factotums harvest the plants and pack them in special containers to keep them fresh before we distribute them to Clockwork City." Lector Naril: "We take clippings from the most robust plants to produce stronger varieties. Someday we'll be able to grow plants outside these walls! "Every season, we share our bounty and select a new apprentice from among the novice apostles. By the way, where did my new apprentice wander off to?" "My new apprentice, Sherizar. Where did she disappear to? Oh, she's off to a bad start. A very bad start." Do you want me to find Sherizar? "And have two novices wandering around the oasis unsupervised? Hmm. Very well. Go find Sherizar and return to me with all due haste. Quickly now. The work of the Wellspring can't wait for an idle apprentice." How do you get the plants to grow in metallic soil? "That's a complicated subject—and one better left to the actual apprentices. Suffice it to say that the process involves water treated with alchemical nutrients and other solutions, as well as our simulated sunlight." How do you simulate sunlight? "That would require an even more complicated answer. Suffice it to say that we use lenses, crystals, and a unique power source to create life-giving light similar to Nirn's sun. But without the apprentices, none of this would be possible." A new apprentice every year? Why do you need so many apprentices? "My program provides an opportunity to work outside the Clockwork Basilica. Lets them try their hand at something different. Besides, keeping the Wellspring going requires a lot of bodies. You'd be surprised at what's required to make my plants grow." "Is there something else I can do for you? You won't find Sherizar by standing here and talking to me." Speaking Tube: "New apprentice, if you can hear my voice, step to the nearest speaking tube this instant." "This is Lector Naril, talking to you through this speaking tube. I assume that you and Sherizar have been exploring the Wellspring. We've built something impressive here, don't you think?" Impressive? I suppose. But we were wondering, where are the other new apprentices? "Other apprentices? Oh, you mean Sherizar's predecessors. The ones selected during the past few harvests. About them, well, they've been dealing with a very special experiment. Utterly secret, you understand. Sherizar and I would like to see them, if that's all right. "Certainly. Just as soon as you report to me. I must complete Sherizar's orientation and training. Some parts of the Wellspring can be extremely dangerous. I'll expect you back in the Viewing Garden before three gears click into place." I had such high hopes for you, Sherizar. Why do you defy me?" We're going to talk to Apprentice Ohtowen. "I see. And does this have to do with the endeavors of the Wellspring? I suppose I can't fault you for your initiative and willingness to get right to work. I just wish you would have waited before you presented yourselves to my other apprentices." Are we prohibited from talking to the other apprentices? "Prohibited? That's a harsh word. No, we don't have any restrictions in the Wellspring. But Sherizar will have a better understanding of how things work here once she returns to me and completes her orientation and training." No restrictions? Apprentice Idrono said no one is allowed in your private workshop. "Did he? My workshop isn't restricted. It's just … private. You must see the necessity for a space of my own. No matter. Finish your task and we can discuss this in more detail. I have impressive plans for you and my new apprentice." Lector Naril: "I'm very disappointed, Sherizar. Chirrhari's plaque of safe passage has been rendered inoperable. Now, return to me immediately." Lector Naril: "So now you know the secret of the Wellspring. You see your role in our grand plan." "Time is short. The life force of the previous apprentices is nearly depleted." Lector Naril: "Why do you resist? Your life force can feed thousands!" Lector Naril: "You lash out because you fail to grasp the importance of what I do!" This page was last modified on 7 September 2018, at 07:56.